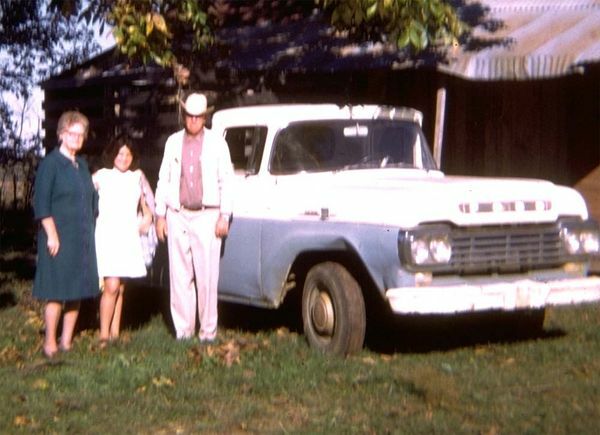 My grandmother and grandfather on the farm in Boswell in 1970. 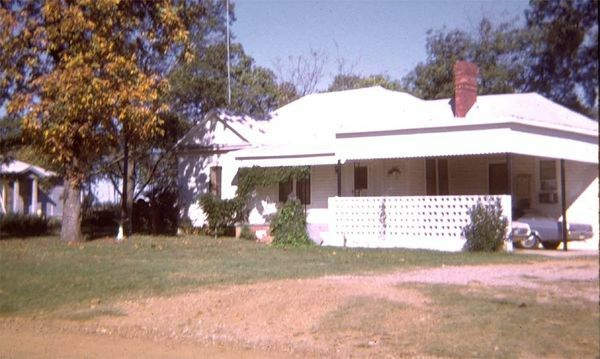 My grandparent's home in Boswell Oklahoma. Fluke Plaza in Ponca City. My great-grandfather William Pickens came to Oklahoma before the turn of the century and put down roots near Boswell, Oklahoma – a small town of a couple of hundred people in Southeast Oklahoma about half way between Hugo and Durant. William Pickens was a veterinarian and he would buy mustangs in Texas and bring them across the the river to Oklahoma and raise them and sell them. I met my great grandfather William in 1955 when I was five years old and I remember being taken to his house about a mile West of Boswell and going into a dark room where he lay in bed, now in his nineties, waiting to die. It was in Boswell that my grandfather Hugh Pickens was born in 1900, there he grew up, there he met my grandmother Ruth Baxter, a schoolteacher whose family came from Durant, and there he married Ruth in the early 1920’s. My grandfather had 160 acres a few miles west of Boswell where he raised cattle and I remember the brand he put on them – a combined "H" and "P." I remember in the 1950’s when I was 6 or 7 years old going out to the farm with grandfather in his old pickup truck with a couple of bales of hay in the back and how he would call the cattle with a special yell and a herd of them would come running for their food in the winter. My grandfather and grandmother lived on the farm through the great depression when no one had any money but they got by and raised four children on the farm. I’ve seen pictures of my grandfather’s farm in the 1930’s from old family albums and they had a big garden where they grew all their own food. My father Dale Pickens, born in 1923, was the oldest son and he lived on the farm with his sister Lelda and brother Gene Ray. My father’s kid sister, Shirley was born later on in the mid-1930’s. After World War II, the four children moved away – there was nothing for them in Boswell. My Aunt Lelda met Bill Roberts, a young veteran who was now an employee of Bell Telephone, and they married and moved to Paul’s Valley, the first of many places they would live as my Uncle Bill had a successful career at Southwestern Bell Telephone over the years. My father served in the Merchant Marines during WWII and after the war took a job on the Rock Island Railroad as a telegraph operator, working all over Arkansas, Kansas, and Oklahoma and finally ending up in Ponca City in 1946. Dale met Delores, the love of his life, in Ponca City and put down roots here that would last for fifty years. My uncle Gene Ray served in the Korean War and after he came back he married Aunt Joyce who also came from Boswell and moved to Coyle, Oklahoma and finally ended up in Ponca City where he and my father were in business together for a short time. 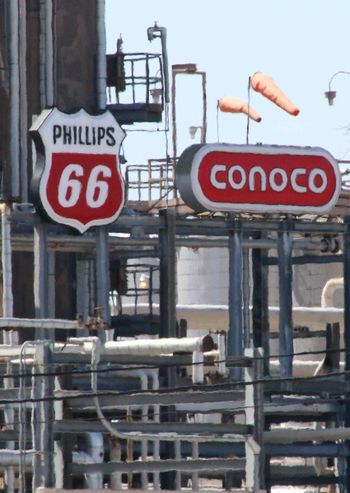 Gene Ray later owned the Conoco Service Station on the corner of Highland and 14th across from the Pioneer Woman statue and ran it for many years. My Aunt Shirley followed in my grandmother’s footsteps and became a teacher, married Bill Wahlman, and moved to Portales, New Mexico. In spite of all the sons and daughters of Hugh Pickens moving away, Boswell remained the center of our family’s universe. After the war, my grandfather and grandmother bought a house in Boswell and every summer in the 1950’s I would go down to Boswell and spend a few weeks with them. Some years they would have a horse for me to ride and most years my cousin Betsy, Aunt Lelda’s daughter, and cousin Brady, Uncle Gene’s oldest son, were in Boswell too. My grandparents house had a wrap around porch and I remember every night the family would go out and sit on the front porch and wait for the neighbors to come over and share a glass of home-made ice tea while we socialized with them and talked about the goings-on around Boswell. By 1960 the fourth generation of the Oklahoma Pickens was complete. I was the oldest cousin, Betsy was about a year younger than me, and Gene Ray’s sons Brady and Craig were a few years younger than Betsy or me. My sister Gail Lynn had been born the previous year and Gene Ray and Joyce’s last son, Jerry Dale had been born earlier that year in July. Three generations of the Pickens family were all together in Boswell in December, 1960 – my grandmother and grandfather; my mother, father, and sister; Aunt Lelda and Uncle Bill and my cousin Betsy; Uncle Gene and Aunt Joyce and my cousins Brady, Craig, and Jerry Dale; and my Aunt Shirley and Uncle Bill. That’s the Christmas that I remember best with my whole family in Boswell. I remember sitting in the living room around the Christmas tree with all the aunts, uncles, and cousins. I remember my grandfather, my father and my three uncles putting their hunting clothes on and going out with their shotguns to hunt and then returning to the house to drink hot coffee and play dominoes for hours. I remember opening the Christmas gifts on Christmas morning with my cousins. I remember my mother, my grandmother, and my aunts in the kitchen cooking up a big Christmas turkey with home-made stuffing and the whole family sitting at the table eating Christmas dinner. I have always kept the images of that Christmas of 1960 in Boswell, Oklahoma in my mind and I’ve remembered that Christmas with particular fondness and in 2005 I had a chance to do something about it. 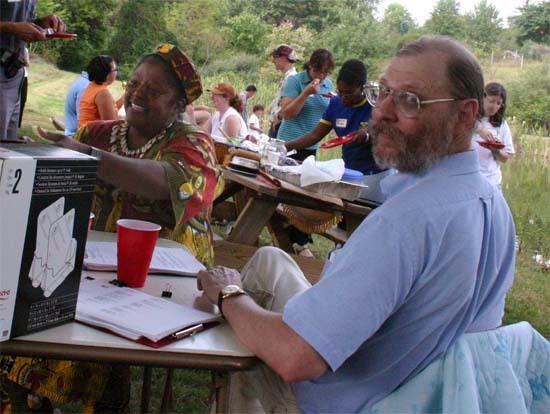 I went to the Centennial Event in September 2006 in Ponca City and I heard Larry Buck announce that a group was getting together to build a Centennial Plaza at the Standing Bear Park and that citizens of Ponca City would get a chance to finance the plaza by buying bricks that would be a part of the plaza. As soon as I heard that I stated thinking about our family and how starting with my great grandfather William Pickens, there have been five generations of Pickens in Oklahoma and I decided that I wanted to support the plaza but also to make a permanent memorial to our family’s heritage in Oklahoma. I remembered Christmas in Boswell in 1960 and how that Christmas had always been a source of strength and comfort to me over the years and decided to recreate that Christmas again in the memorial plaza. 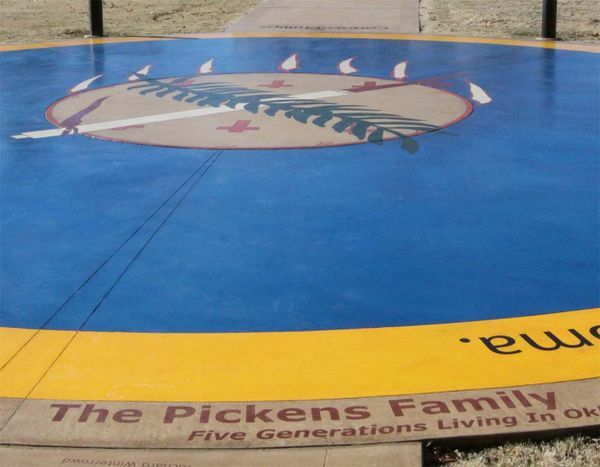 If you go to the Fluke Memorial Plaza and look closely you will see in the North East corner of the Flag area that there is an area dedicated to five generations of the Pickens family that brings my whole family together again. There are forty bricks in the flag area that represent all the members of the Pickens family. Take a look at the names I have mentioned, my aunts and uncles and cousins, and you will see all of them in the plaza. There are some additional names in the plaza. My wife’s grandfather Norwood Shields came to Oklahoma while it was still Indian Territory and was a professor of agriculture at Langston College and that’s where my wife’s mother was born in 1907 and you’ll see their names on the plaza too. You'll also see the husbands and wives of my cousins and the names of their children in the plaza as well as some of our closest friends from Baltimore. Many of the people who were at Christmas in Boswell in 1960 are gone now. My grandfather died in 1973 and his wife followed him in 1984. My father died on November 16, 1997 – exactly ten years to the day before the dedication of the Fluke plaza and my Aunt Lelda died about three years ago. Now everyone from that Christmas in 1960 is still together at the Plaza and that gives me great comfort and joy. May you and your family have a joyful holiday and pass it in the company of your friends and family and remember the wonderful times you have shared together over the years. This page was last modified on 6 April 2018, at 17:37.